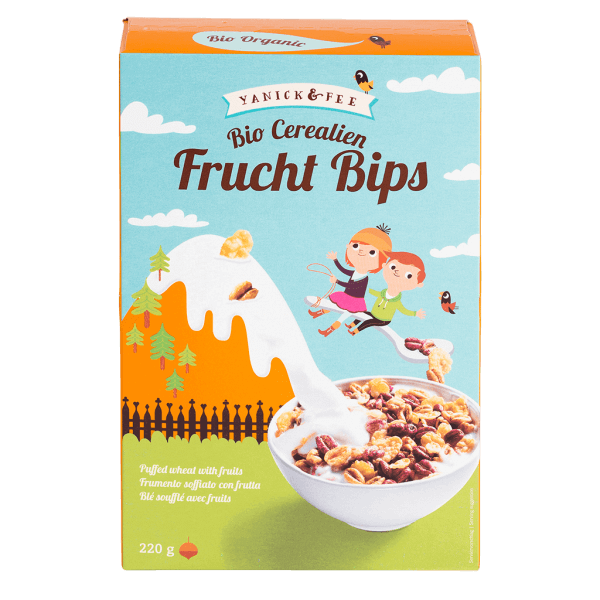 Puffed wheat, naturally coloured with blueberry, strawberry and carrot juice and blended wih crunchy, traditional-style cornflakes for a great, colourful start to the day. 100% organic and wonderfully crisp and fruity. Good morning! Puffed wheat carrot* (Durum wheat*, corn syrup*, cane sugar*, carrot juice concentrate* 6,2 %, sunflower oil*), puffed durum wheat blueberry* (durum wheat*, corn syrup*, cane sugar*, fruit juice concentrate* 5,9 % (blueberry juice*, strawberry juice*), sunflower oil*), cornflakes* (corn* 98 %, sea salt), bananas* 2 %, strawberries* 2 %. > May contain traces of sesame seeds, soy and nuts. Best enjoyed with fresh fruit, milk, yoghurt or quark. Also great as a topping for cream or ice-cream desserts.Best enjoyed with fresh fruit, milk, yoghurt or quark. Also great as a topping for cream or ice-cream desserts.